The early 1970's were chaotic years for Hamilton. Designs changed dramatically and control of the company shifted frequently as production was moved to Hamilton's former Buren facility in Switzerland. I guess it's understandable that there are lots of models that were uncatalogued from this period. They may have been used for export markets other than the US. One such model is a Thinline example that is known only by the number on the back... 912373. Generally speaking, the serial number of cases is irrelevant. It mattered only to the maker of the case. 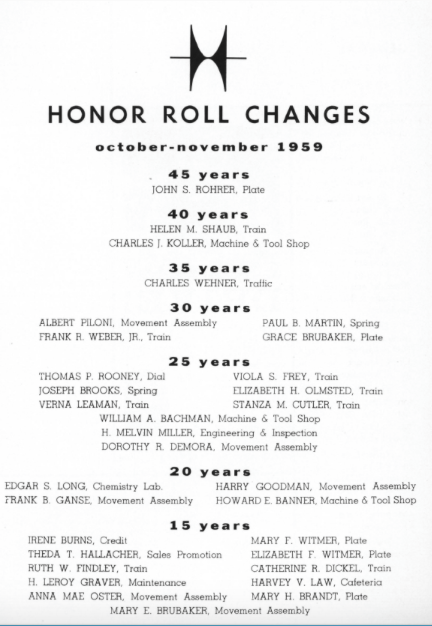 However, in the 1960's two sets of numbers started to get added to cases. 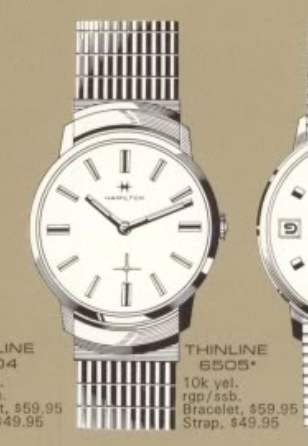 One was the unique serial number of the watch case, and the other is a number that indicates the model that the case was used for. Most of the time the watch had a model name but sometimes all you have to go with is the model number. Typically the last two digits of the number represents the year the watch was introduced. When there's a dash at the end, the number after the dash represents the case material. Anyway, I recently landed a Thinline project watch and at first blush I thought for sure I'd be able to identify it. The 12, 3, 6 and 9 hour markers have a black stripe, which I thought would be a good clue. However, the best I could come up with was a 1968 Thinline 6505. There are some key differences though. For example, the hands are luminous and the other hour markers are about as long as the 12, 3, 6 and 9. Close but no cigar. When I looked at the back I saw several interesting tidbits. First, there are a few scratches from someone trying to open the case. Stainless steel backs on yellow cases always tempts the uninitiated to try to remove the stainless back. Also, the model number is stamped there, making it clear this is a 1973 model. Lastly, the case material has a "base metal bezel". That's very unusual in pre-1969 models... pretty much unheard of for vintage Hamiltons, in fact. Removing the crystal gives access to the dial. Positioning the two piece stem allows the movement to fall out the front of the case. The radial-finished dial looks great. No moisture appears to have gotten into this watch. Inside is a Hamilton 639 movement based on a Buren grade. This is a classic Thinline movement and appears to be untouched since it was first installed. The inside of the case back is properly stamped, so it's a legitimate Hamilton model. The serial number inside is unique to this watch. It's nice to work on a manual-winding watch for a change. I feel like most of the watches I've done as of late have been very challenging micro-rotors. This is a nice break. Everything is cleaned and dried. The reassembled movement is ticking away nicely. Now it's off to the timer to see how well it's performing. Not too bad. On most watches all I would do is slow it down a smidgen but this caliber is easy to adjust so I will try to dial it in more precisely. A tweak here, a tweak there, another tweak to correct the other tweak... eventually I get everything to line up where I want it. It doesn't get any better than this. Thinline models with sub second hands have very low profiles. In fact, from the side you can just barely see the hands. So I will use a PK-style low profile crystal to celebrate this watch's thin-ness. It's actually a pretty large crystal. This watch is a little bigger than your typical pre-1969 model. 30.8mm will do the trick. With a new crystal and a fresh lizard strap, this Thinline 912373 looks and runs like a brand new watch. 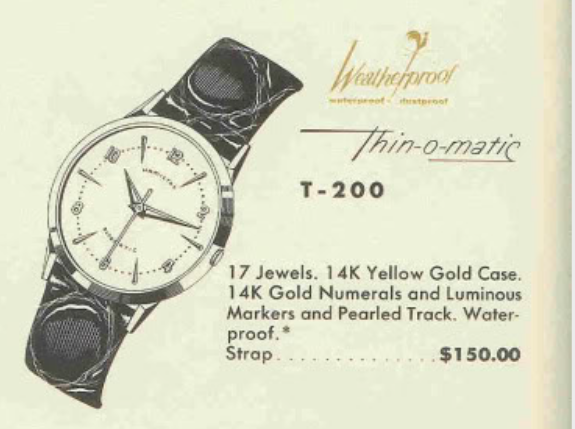 It's a sharp looking watch, especially for something from the 1970s. 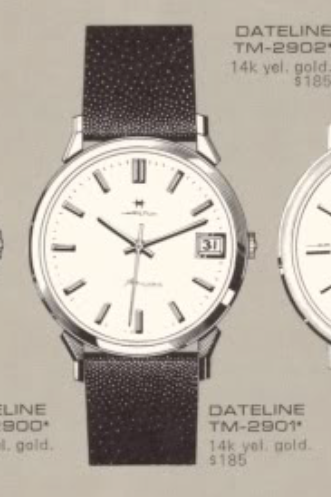 Some of Hamilton's models have what appear to be parchment dials. They have a texture that you would think would be very hard to replicate at a dial refinisher. 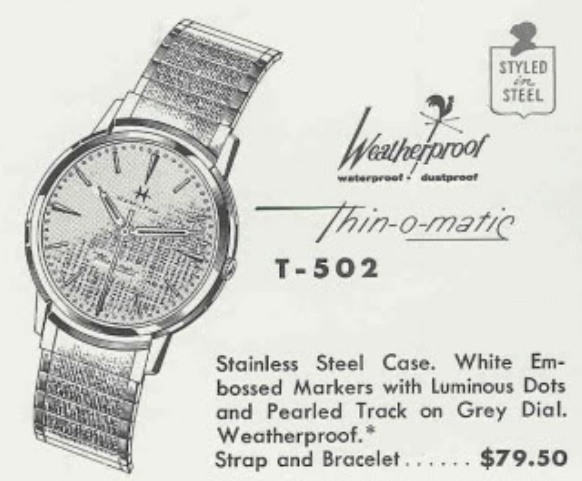 A good example is the 1960 Thin-o-matic T-502. The T-502 has a silver-colored dial with a textured finish. The model was produced through 1965 but the last two years the model was referred to as the T-502B. It looks the same but it's not clear what changed to make it a B model. It could have a one-piece case or it might have a significantly different movement. The movement inside the T-502 is a 17 jewel 663 micro rotor movement. I've had a T-502 project watch on the bench for a while and I've finally gotten around to doing it. As received, it appears to be in decent shape. The crystal is a little yellowed and scratched up but otherwise it looks fine. This stainless steel case has a snap on case back. There's a slight lip in between the lugs that you can slip a case knife into and pry the back off. The movement is quite dirty but looks to be in decent shape. It's definitely overdue for a cleaning. The case back has a rub mark from the rotor spinning. I'll have to make sure it's more deeply seated when I reinstall it. I didn't initially realize that the hands on my watch have been painted black. They should be silver and have luminous paint on them. So I'll have to strip the paint off these to restore them. I noticed one of the wheels for the automatic gear train is missing a pivot. I'll replace it with a part from a donor movement. The movement is back to looking and running well. Looks like everything is operating just as it should. I'll leave it running a little fast for now. A new crystal, fresh luminous paint and a nice black lizard strap complete the restoration. I have to say the watch looks a lot better without the black paint on the hands. This is now a sharp-looking watch. I wouldn't want to have to get this dial refinished though - as it would probably lose dome details in the process. Fortunately this dial is in excellent condition. I'm sure the watch would look very interesting with it's original bracelet. It had a textured finish to match the dial.